Forty decorative items of gold found in a tomb had been decorative elements for horse harness more than 2200 years ago, according to researchers. The haul of treasure, unearthed from a burial mound in southeastern Bulgaria, has been described in the Bulgarian e-Journal of Archaeology. The tomb was Thracian – a group of Indo-European tribes that once inhabited a large area in Eastern and Southeastern Europe. The mound, northwest of the town of Primorsko, was excavated by archaeologists in 2016. The foundations of a rectangular feature were discovered in the eastern part of the mound. During the excavation of this feature, 40 gold appliqués were found over an area of about two square metres. A clay lamp found buried together with the gold suggested the items were placed in the tomb around 333 to 250 BC. Researchers Petar Balabanov and Daniel Pantov say the treasure is the first fully preserved set of gold decorations for horse harness found south of the Balkan Mountains. The central element of the set was two small joined gold shields on which an eagle’s head was mounted. The piece weighed 23.25 grams. The eagle’s head had been made by casting. Its entire manufacture required a range of techniques – casting, forging, openwork and welding. Its creator was aiming for realism in the details of the eagle, with plumage, eyes, eyebrows and the base of the bird’s beak all carefully formed. Another round piece in the haul featured stylized embossed floral patterns. Most of the remaining pieces were round, with 32 of them said to have been designed to decorate a bridle. Two of the fanciest pieces, which were elongated, were probably designed to be placed on both sides of the horse’s mouth. A specific feature is the insertion of stylized leaves. “The manufacture of the currently reported elements of a treasure point to two main conclusions,” Balabanov and Pantov said. However, the fewer number of elements, the relatively inferior details and the less careful manufacture of the individual decorative elements, as well as the lower weight of the individual appliqués compared to those discovered elsewhere, suggest that he did not work in one of the well-known workshops. The pair said it was relatively easy to restore the place of the individual elements on the leather harness on the horse’s head. “Obviously, the central element with an embossed eagle’s head was placed in the centre of the forehead.” The use of an eagle suggested a certain level of power, perhaps even indicating its owner was part of a dynasty. The round appliqués were probably placed on the horizontal and vertical straps that formed the bridle, and the oblong ones on both sides of the horse’s mouth at the end of the bit rings. “The place of the round appliqué is probably on the animal’s nose and the small appliqués have been attached to the bridle strap. More interdisciplinary work is planned to learn more about the set, the authors said. They clearly possessed significant power and economic resources. The evidence suggested the items were manufactured in the area in which they were unearthed. “This raises the question of the possibility that a Thracian goldsmith workshop existed during the Hellenistic period, and its products, in terms of design and quality, are significantly different from the famous findings from the necropolises of the nearby Apollonia Pontica,” they said. During underwater archaeological exploration in the 1980s, the oldest skulls of domestic horses in Europe were discovered near the shore of the Black Sea near the Bulgarian town of Kiten. They were found in the ruins of a settlement that existed in the Early Bronze Age and are dated to the 20th to 18th century BC. “The admiration of the Hellenes (ancient Greeks) of the horses grown in Thrace is expressed many times in the famous poem Iliad. The snow-white horses of the Thracian king Rezos are especially famous,” Balabanov told Horsetalk. “The extremely important role that horses played in the life and religion of the Thracian tribes in the first millennium BC is evidenced by images of coins, gold and silver vessels, horse-headed rhytones (drinking vessels) and other artifacts. “Elements of horse-harness decoration, made of precious metals (mostly silver, not so often gold and bronze), are among the frequently found findings in exploring objects from the middle-second half of the 1st millennium B.C. in Thrace. “The technology of making and the ornaments and images used show the existence of specialized production serving a large number of people. “At the same time, in the early Iron Age, iron bridles, the structure of which is slightly different from the modern ones, appeared in the country. As early as the time of the creation of the treasure unearthed in Primorsko, horsemen in Thrace had already used spurs, he says. Balabanov is with the Department of Archaeology at the New Bulgarian university in Sofia, and Pantov is with the Municipal History Museum in Primorsko. Balabanov, P. and Pantov, D. 2018. 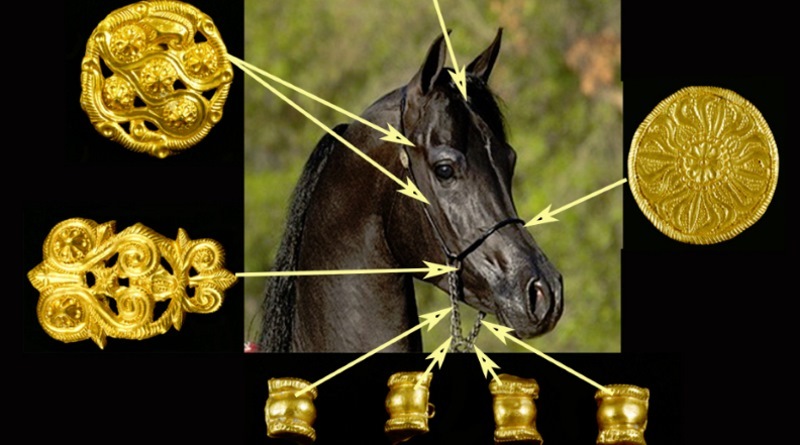 Treasure of gold appliqués for horse harness from Primorsko. Bulgarian e-Journal of Archaeology / Българско е-Списание за Археология. 8, 1 (Jun. 2018), 1-16. The paper, published under a Creative Commons License, can be read here.